Some courses at UW-Stout use digital textbooks. Learn@UW-Stout has integrations with several e-textbook providers. The integrations will allow access to your textbook without having to reenter a username and password. 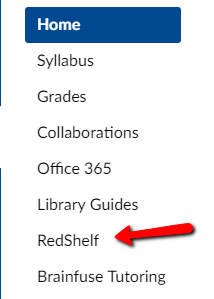 e-Textbooks can be accessed using the RedShelf link on the Canvas course navigation menu.